Back in January 2014, I wrote an article called Cardinality Estimation for Multiple Predicates that described the cardinality estimation process for queries with multiple predicates, from the point of view of the old and new cardinality estimators. The article describes the various behaviours and formulas involved, along with the usual sprinkling of documented and undocumented trace flags. I described the formula SQL Server 2014 uses to calculate a cardinality estimate for multiple predicates connected with AND (conjunctive predicates), which was already relatively well-known. Despite some fairly energetic research, and basic-to-intermediate skills with Excel, I was unable to deduce a similar formula for the disjunctive case, where predicates are connected by OR. The trace flag output I describe in the other article clearly showed that exponential backoff was used in the new 2014 cardinality estimator, but the precise formula eluded me. Nested loops join query plans can be a lot more interesting (and complicated) than is commonly realized. One query plan area I get asked about a lot is prefetching. It is not documented in full detail anywhere, so this seems like a good topic to address in a blog post. The examples used in this article are based on questions asked by Adam Machanic. The query optimizer does not always choose an optimal strategy when joining partitioned tables. This post looks at an example of that, showing how a manual rewrite of the query can almost double performance, while reducing the memory grant to almost nothing. This post is in two parts. The first part looks at the Switch execution plan operator. The second part is about an invisible plan operator and cardinality estimates on filtered indexes. I love SQL Server execution plans. It is often easy to spot the cause of a performance problem just by looking at one closely. That task is considerably easier if the plan includes run-time information (a so-called ‘actual’ execution plan), but even a compiled plan can be very useful. Nevertheless, there are still times when the execution plan does not tell the whole story, and we need to think more deeply about query execution to really understand a problem. This post looks at one such example, based on a question I answered. I have written a four-part series for SQLPerformance.com on the Halloween Problem. Some of you will never have heard about this issue. Those that have might associate it only with T-SQL UPDATE queries. In fact, the Halloween Problem affects execution plans for INSERT, UPDATE, DELETE and MERGE statements. That future post never materialized, so I thought I would have a go. The four parts of the series are summarized and linked below, I hope you find the material interesting. The Knowledge Base article does not go into detail, or provide a reproduction script, but this blog post does. Let’s say you have a big table with a clustered primary key, and an application that inserts batches of rows into it. The nature of the business is that the batch will inevitably sometimes contain rows that already exist in the table. Most tuning efforts for data-changing operations concentrate on the SELECT side of the query plan. Sometimes people will also look at storage engine considerations (like locking or transaction log throughput) that can have dramatic effects. A number of common practices have emerged, such as avoiding large numbers of row locks and lock escalation, splitting large changes into smaller batches of a few thousand rows, and combining a number of small changes into a single transaction in order to optimize log flushes. This is all good, but what about the data-changing side of the query plan — the INSERT, UPDATE, DELETE, or MERGE operation itself — are there any query processor considerations we should take into account? The short answer is yes. The query optimizer considers different plan options for the write-side of an execution plan, though there isn’t a huge amount of T-SQL language support that allows us to affect these choices directly. Nevertheless, there are things to be aware of, and things we can look to change. Estimated row counts on Key or RID Lookups where a filtering predicate is applied can be wrong in SSMS execution plans. This error does not affect the optimizer’s ultimate plan selection, but it does look odd. There are other cases where estimated row counts are inconsistent (for defensible reasons) but the behaviour shown in this post in certainly a bug. Why Doesn’t Partition Elimination Work? Given a partitioned table and a simple SELECT query that compares the partitioning column to a single literal value, why does SQL Server read all the partitions when it seems obvious that only one partition needs to be examined? The humble Compute Scalar is one of the least well-understood of the execution plan operators, and usually the last place people look for query performance problems. It often appears in execution plans with a very low (or even zero) cost, which goes some way to explaining why people ignore it. Some readers will already know that a Compute Scalar can contain a call to a user-defined function, and that any T-SQL function with a BEGIN…END block in its definition can have truly disastrous consequences for performance (see When is a SQL function not a function? by Rob Farley for details). This post is not about those sorts of concerns. Can DELETE operations cause pages to split? Yes. It sounds counter-intuitive on the face of it. Deleting rows frees up space on a page, and page splitting occurs when a page needs additional space. Nevertheless, there are circumstances when deleting rows causes them to expand before they can be deleted. SQL Server (since 2005) caches temporary tables and table variables referenced in stored procedures for reuse, reducing contention on tempdb allocation structures and catalogue tables. Temporary objects are often created and destroyed at a high rate in production systems, so caching can be an important optimization. Ask anyone what the primary advantage of temporary tables over table variables is, and the chances are they will say that temporary tables support statistics and table variables do not. This is true, of course. The indexes that enforce PRIMARY KEY and UNIQUE constraints on table variables do not have populated statistics associated with them. Neither do any non-constraint table variable indexes (using inline index definitions, available starting with SQL Server 2014). Finally, it is not possible to manually create statistics on table variables. Intuitively, then, any query that has alternative execution plans to choose from ought to benefit from using a temporary table rather than a table variable. This is also true, up to a point. Summary: A deep dive into SQL Server parallelism, and a potential performance problem with parallel plans that use TOP. This is the final part in a series of posts based on the content of the Query Optimizer Deep Dive presentations I have given over the last month or so at the Auckland SQL Users’ Group, and SQL Saturday events in Wellington, New Zealand and Adelaide, Australia. Our AdventureWorks test query produces an optimized physical execution plan that is quite different from the logical form of the query. The estimated cost of the execution plan shown below is 0.0295 units. Since we know the database schema very well, we might wonder why the optimizer did not choose to use the unique nonclustered index on Name in the Product table to filter rows based on the LIKE predicate. This is the third in a series of posts based on the content of the Query Optimizer Deep Dive presentations I have given over the last month or so at the Auckland SQL Users’ Group, and SQL Saturday events in Wellington, New Zealand and Adelaide, Australia. We saw in part 2 how optimizer rules are used to explore logical alternatives for parts of the query tree, and how implementation rules are used to find physical operations to perform each logical steps. To keep track of all these options, the cost-based part of the SQL Server query optimizer uses a structure called the Memo. This structure is part of the Cascades general optimization framework developed by Goetz Graefe. This is the second in a series of posts based on the content of the Query Optimizer Deep Dive presentations I have given over the last month or so at the Auckland SQL Users’ Group, and SQL Saturday events in Wellington, New Zealand and Adelaide, Australia. The input to cost-based optimization is a tree of logical operations produced by the previous optimization stages discussed in part one. Cost-based optimization takes this logical tree, explores logical alternatives (different logical tree shapes that will always produce the same results), generates physical implementations, assigns an estimated cost to each, and finally chooses the cheapest physical option overall. The goal of cost-based optimization is not to find the best possible physical execution plan by exploring every possible alternative. Rather, the goal is to find a good plan quickly. This is the first in a series of posts based on the content of the Query Optimizer Deep Dive presentations I have given over the last month or so at the Auckland SQL Users’ Group, and SQL Saturday events in Wellington, New Zealand and Adelaide, Australia. The motivation behind writing these sessions is finding that relatively few people have a good intuition for the way the optimizer works. This is partly because the official documentation is rather sparse, and partly because what information is available is dispersed across many books and blog posts. The content presented here is very much geared to my preferred way of learning. It shows the concepts in what seems to me to be a reasonably logical sequence, and then provides tools to enable the interested reader to explore further, if desired. There are interesting things to be learned from even the simplest queries. For example, imagine you are asked to write a query that lists AdventureWorks product names, where the product has at least one entry in the transaction history table, but fewer than ten. This article is for SQL Server developers who have experienced the special kind of frustration that only comes from spending hours trying to convince the query optimizer to generate a parallel execution plan. This situation often occurs when making an apparently innocuous change to the text of a moderately complex query — a change which somehow manages to turn a parallel plan that executes in ten seconds, into a five-minute serially-executing monster. I came across a SQL Server optimizer bug recently that made me wonder how on earth I never noticed it before. As the title of this post suggests, the bug occurs in common JOIN and GROUP BY queries. While it does not cause incorrect results to be returned, it will often cause a poor query plan to be selected by the optimizer. If you are just interested in the bug itself, you will find a description in the section headed “the bug revealed”. It relates to cardinality estimation for serial partial aggregates. As the regular reader will be expecting though, I am going to work up to it with a bit of background. The lasting value of this post (once the bug is fixed) is in the background details anyway. Is Distinct Aggregation Still Considered Harmful? Back in 2008, Marc Friedman of the SQL Server Query Processor Team wrote a blog entry entitled “Distinct Aggregation Considered Harmful”. Marc shows a way to work around the poor performance that often results simply from adding the keyword DISTINCT to an otherwise perfectly reasonable aggregate function in a query. This post is an update to that work, presenting a query optimizer enhancement in SQL Server 2012 that reduces the need to perform the suggested rewrite manually. In this post, I show you how to determine the statistics objects used by the query optimizer in producing an execution plan. Note: This technique only applies to queries compiled using the original (70) cardinality estimation model. Can a SELECT query cause page splits? When a new row is added to a full index page, the Database Engine moves approximately half the rows to a new page to make room for the new row. This reorganization is known as a page split. A page split makes room for new records, but can take time to perform and is a resource intensive operation. Also, it can cause fragmentation that causes increased I/O operations. Given that, how can a SELECT statement be responsible for page splits? Well, I suppose we could SELECT from a function that adds rows to a table variable as part of its internal implementation, but that would clearly be cheating, and no fun at all from a blogging point of view. In test 1, making the clustered index unique improved performance by around 40%. In test 2, making the same change reduced performance by around 70% (on 64-bit systems – more on that later). In my last post, Enforcing Uniqueness for Performance, I showed how using a unique index could speed up equality seeks by around 40%. When is a Seek not a Seek? So…is it a Seek or a Scan? A singleton equality seek always retrieves exactly one row, and is guaranteed to do so because a unique index exists to enforce it. A range scan seeks down the B-tree to a starting (or ending) point, and scans forward (or backward) from that point using the next or previous page pointers. Today’s short post shows how much faster a singleton seek is, compared with a range scan, even when both return exactly the same number of records. You probably already know that it’s important to be aware of data types when writing queries, and that implicit conversions between types can lead to poor query performance. Some people have gone so far as to write scripts to search the plan cache for CONVERT_IMPLICIT elements, and others routinely inspect plans for that type of thing when tuning. Now, that’s all good, as far as it goes. It may surprise you to learn that not all implicit conversions are visible in query plans, and there are other important factors to consider too. Can a parallel query use less CPU than the same serial query, while executing faster? There’s a complete script to create the table and add the data at the end of this post. There’s nothing special about the table or the data (except that I wanted to have some fun with values and data types). The logic is clear: Join rows from the two sets together on the primary key column, and return rows where a change has occurred in one or more data columns. The problem is that our query does not correctly handle NULLs. You might have noticed that January was a quiet blogging month for me. This introductory piece is not quite as technical as normal, but I hope there be enough interesting material there to make it worth a read. It’s a curious thing about SQL that the SUM or AVG of no items (an empty set) is not zero, it’s NULL. In this post, you’ll see how this means your SUM and AVG calculations might run at half speed, or worse. As usual though, this entry is not so much about the result, but the journey we take to get there. There is much more to query tuning than reducing logical reads and adding covering nonclustered indexes. Query tuning is not complete as soon as the query returns results quickly in the development or test environments. In production, your query will compete for memory, CPU, locks, I/O, and other resources on the server. Today’s post looks at some tuning considerations that are often overlooked, and shows how deep internals knowledge can help you write better T-SQL. Is it possible to see LOB (large object) logical reads from STATISTICS IO output on a table with no LOB columns? I was asked this question today by someone who had spent a good fraction of their afternoon trying to work out why this was occurring — even going so far as to re-run DBCC CHECKDB to see if corruption was the cause. The table in question wasn’t particularly pretty. It had grown somewhat organically over time, with new columns being added every so often as the need arose. Nevertheless, it remained a simple structure with no LOB columns — no text or image, no xml, no max types — nothing aside from ordinary integer, money, varchar, and datetime types. To add to the air of mystery, not every query that ran against the table would report LOB logical reads — just sometimes — but when it did, the query often took much longer to execute. A seek can contain one or more seek predicates, each of which can either identify (at most) one row in a unique index (a singleton lookup) or a range of values (a range scan). When looking at an execution plan, we often need to look at the details of the seek operator in the Properties window to see how many operations it is performing, and what type of operation each one is. As seen in the first post of this mini-series, When is a Seek not a Seek? the number of hidden seeking operations can have an appreciable impact on performance. Both mention scans and ranges (nothing about seeks) and the Index Seek description maybe implies that it will not scan the index entirely (which isn’t necessarily true). Not massively helpful. The following script creates a single-column clustered table containing the integers from 1 to 1,000 inclusive. Find the rows with values from 100 to 170, excluding any values that divide exactly by 10. Might SQL Server retrieve (out-of-row) LOB data from a table, even if the column isn’t referenced in the query? 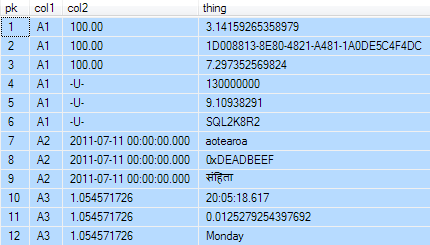 Leaving aside trivial cases like selecting a computed column that does reference the LOB data, one might be tempted to say that no, SQL Server does not read data you haven’t asked for. 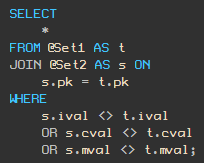 In general, that is correct; however, there are cases where SQL Server might sneakily read a LOB column. Brad Schulz recently wrote about optimizing a query run against tables with no indexes at all. The problem was, predictably, that performance was not very good. The catch was that we are not allowed to create any indexes (or even new statistics) as part of our optimization efforts. In this post, I’m going to look at the problem from a different angle, and present an alternative solution to the one Brad found. Many people believe that whenever SQL Server creates an execution plan that uses parallelism, an alternative serial plan is also cached. The idea seems to be that the execution engine then decides between the parallel and serial alternatives at runtime. I’ve seen this on forums, in blogs, and even in books. In fairness, a lot of the official documentation is not as clear as it might be on the subject. In this post I will show that only a single (parallel) plan is cached. I will also show that SQL Server can execute a parallel plan on a single thread. If I hold an exclusive lock on a row, can another transaction running at the default read committed isolation level read it? Most people would answer ‘no’, on the basis that the read would block when it tried to acquire a shared lock. Others might respond that it depends on whether the READ_COMMITTED_SNAPSHOT database option was in effect, but let’s assume that is not the case, and we are dealing simply with the default (locking) read committed isolation level. Sometimes though, the database designer needs a more flexible scheme than is provided by the IDENTITY property. One alternative is to use a Sequence Table. If a clustered index exists, INDEX(0) forces a clustered index scan and INDEX(1) forces a clustered index scan or seek. If no clustered index exists, INDEX(0) forces a table scan and INDEX(1) is interpreted as an error. The interesting thing there is that both hints can result in a scan. If that is the case, you might wonder if there is any effective difference between the two. This blog entry explores that question, and highlights an optimizer quirk that can result in a much less efficient query plan when using INDEX(0). I’ll also cover some stuff about ordering guarantees. A detailed look at costing, and more undocumented optimizer fun. The SQL Server query optimizer generates a number of physical plan alternatives from a logical requirement expressed in T-SQL. If full cost-based optimization is required, a cost is assigned to each iterator in each alternative plan, and the plan with the lowest overall cost is ultimately selected for execution. When you write a query to return the first few rows from a potential result set, you’ll often use the TOP clause. To give a precise meaning to the TOP operation, it will normally be accompanied by an ORDER BY clause. Together, the TOP…ORDER BY construction can be used to precisely identify which top ‘n’ rows should be returned. You might recall from Inside the Optimizer: Row Goals In Depth that query plans containing a row goal tend to favour nested loops or sort-free merge join over hashing. This is because a hash join has to fully process its build input (to populate its hash table) before it can start probing for matches on its other input. Hash join therefore has a high start-up cost, balanced by a lower per-row cost once probing begins. In this post, we will take a look at how row goals affect grouping operations. One of the core assumptions made by the SQL Server query optimizer cost model is that clients will eventually consume all the rows produced by a query. This results in plans that favour the overall execution cost, though it may take longer to begin producing rows. Is it possible to view the contents of a local temporary table, created on a different connection? Is there a way to see the contents of the #Private table from connection 2? It isn’t particularly easy, but a user with sysadmin permissions, a bit of internal knowledge (and some patience) can do it. From time to time, I encounter a system design that always issues an UPDATE against the database after a user has finished working with a record — without checking to see if any of the data was in fact altered. The prevailing wisdom seems to be “the database will sort it out”. This raises an interesting question: How smart is SQL Server in these circumstances? In this post, I’ll look at a generalisation of this problem: What is the impact of updating a column to the value it already contains? Does this kind of UPDATE generate any log activity? Do data pages get marked as dirty (and so eventually get written out to disk)? Does SQL Server bother doing the update at all? SQL Server uses an extensible architecture for query optimization and execution, using iterators as the basic building blocks. Each iterator performs a single simple function, such as applying a filtering condition, or performing an aggregation. It can represent a logical operation, a physical operation, or (most often) both. Investigating an optimizer transformation that exposes a bug in SQL Server’s MERGE implementation. More undocumented ways to explore how the query optimizer works. Presenting an undocumented Dynamic Management View we can use to identify the optimization rules involved in producing an executable plan. Continuing the series of posts looking at how the optimizer matches and applies internal rules to refine a query plan. The optimizer has pushed the predicate ProductNumber LIKE 'T%' down from a Filter to the Index Scan on the Product table, but it remains as a residual predicate. For today’s entry, I thought we might take a look at how the optimizer builds an executable plan using rules. To illustrate the process performed by the optimizer, we will configure it to produce incrementally better plans by progressively applying the necessary rules. In my last post I showed how SQL Server 2005 and later can use a Segment Spool to implement aggregate window functions and the NTILE ranking function. The query optimizer is also smart enough to recognise that some queries are logically equivalent to a window function, even if they are written using different syntax. SQL Server 2005 introduced the OVER clause to enable partitioning of rowsets before applying a window function. This post looks at how this feature may require a query plan containing a ‘common subexpression spool’. This query plan construction is required whenever an aggregate window function or the NTILE ranking window function is used. In my last post I promised to cover the Segment iterator in more detail, so here we go. The Segment iterator partitions rows into groups as they flow through a query plan, checking whether the current row belongs in the same group as the previous row. For this to work, the incoming rows must be presented in an order which guarantees that all members of a group are received sequentially. Segment has a “Group By” argument to specify how it should partition its input. The iterator adds an additional column to the rows that flow through it. This new column is used to communicate with its parent iterator, and is named something like [Segment1003]. The new column is visible in the graphical query plan properties window, or by hovering your mouse cursor over the Segment operator. The attribute name in both cases is Segment Column). A question that often comes up on the forums is how to get the first or last row from each group of records in a table. This post describes a clever query plan optimisation that SQL Server can use for these types of query. Why Doesn't Partition Elimination Work? © Copyright Paul White. All rights reserved.. Simple theme. Theme images by A330Pilot. Powered by Blogger.